Growing up in America, we notice that the words ‘African Americans’ and ‘Freedom’ often show up together. We had the Freedomways Magazine, there were Freedom Schools, Freedom songs, Freedom marches etc. Later in the 1970’s the word “liberation” was the trend- and seeing freedom and liberation used in tandem with ‘black people’ has never faded. This society seems to condone or endorse this practice. But now, one wonders what does freedom mean? For slaves it would seem clear – freedom from shackles, but was that all? After the shackles were removed, their children also sought freedom - from Jim Crow? 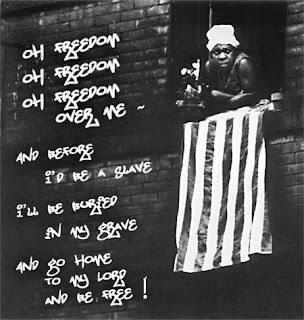 Now after Jim Crow we still hear the word freedom used as a goal. However, what does this freedom mean? Does it mean the freedom to do something? Does it mean Freedom from something or someone? Do we want freedom to act just like everyone else we see? Do we want freedom from responsibility? Or is it true that freedom is responsibility? Should we seek personal freedom, economic freedom? Is it the same as when we hear that America is leader of the free world? (Does freedom have leaders?) Should we even be associated with this word? Is it too vague- or can it be defined? What is meant by black freedom? Okay so we have freedom from physical constraints. We're still enslaved mentally because we have no self identity. We're still wanting to be accepted by Them. Not until we know who we are and then act as such, absolute freedom will forever evade us. Seems like we can free ourselves from mental slavery. We don't need anyone's permission to do that. Once you know who you are in terms of your purpose, values, and interests outside the standards created by the dominant culture's standards, you then can pursue goals based in your own distinct culture. American culture is often regarded as neutral if it is even acknowledged but in reality is often invisible. It's not the process that trips us as a people it is the content! If you don't utilize a standard that reflects your strengths and your values, you play to other's strengths and accept values that might actually be hindering your ability to be your authentic self. I'm not sure what you mean by culture Hudgins. I think we have a robust culture. Black people are only "culture-less" when measured next to the stark values of ambition and conquest. Black folks are perhaps the most resilient people on the planet. And we live today - despite all kinds of circumstances - because of that resiliency and zest for life. Isn't that culture? I believe a vibrant robust black culture exists for some people. I also believe many people do not feel connected to it or don't recognize it for many different reasons. The culture I'm talking about is one we define for ourselves, includes african principles and values, and promotes the best in all of us. It's not a culture created in response or as a reaction to a condition such as slavery or racism. Because America pretends to be colorblind and culture neutral many Black people adopt the "culture" of the society at the expense of their own best interests and as a result are not "free"
I also agree that we are the most resilient people in the world, my point is knowledge of self informs the decisions and the direction you take in your life as an individual and as a group. To me this equates to real freedom. That was a well formulated explanation Patrick; I agree. There is a whole chapter devoted to understanding what a culture is and why it is so sorely needed in the chapter 'Why A Culture?' 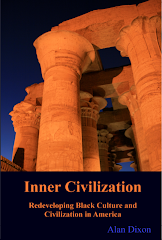 in the book "Inner Civilization". In discussing that need I included this acknowledgment... "Many believe that African Americans already have a culture. It is likely at this point, that one may be tempted to become defensive about what culture we have managed to preserve; nevertheless keep in mind that a priority in any worthwhile culture is nurturing a relentless drive to find a way to grow, adapt and improve...In my view, culture involves the development of a shared system of beliefs, values, fundamental principles and ideals that serve as the basis of a peoples’ human expression. A culture is also the environment people deliberately create to facilitate the fulfillment of their common aspirations. Culture has a reciprocal quality. As a culture is enriched and developed by its people, it tends to enrich and develop its people as well.